Ace Frehley performed his 1978 hit, "New York Groove", during the pre-game festivities at the 2018 Bridgestone NHL Winter Classic on New Year's Day, and video of the event has surfaced online. 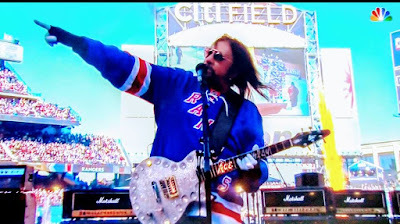 The track from Frehley’s KISS-era solo album is played at Citi Field following every home win by the New York Mets, and was chosen by the New York Rangers for the guitarist’s appearance as they hosted the Buffalo Sabres at the stadium for the 10th anniversary edition of the annual NHL event. Viewers were only able to see a small part of Frehley’s performance during the NBC broadcast as the rocker and his band were on stage while the players from both teams were shown entering the stadium. The Goo Goo Dolls were seen performing during the first intermission, while the event’s house band, Max Weinberg’s Jukebox – led by E Street drummer Max Weinberg – were not referenced at all by NBC despite playing throughout the 3-hour broadcast. Frehley has been in the studio working on the follow-up to his 2016 all-star covers album, “Origins Vol. 1”, and is expected to issue a new record this year.